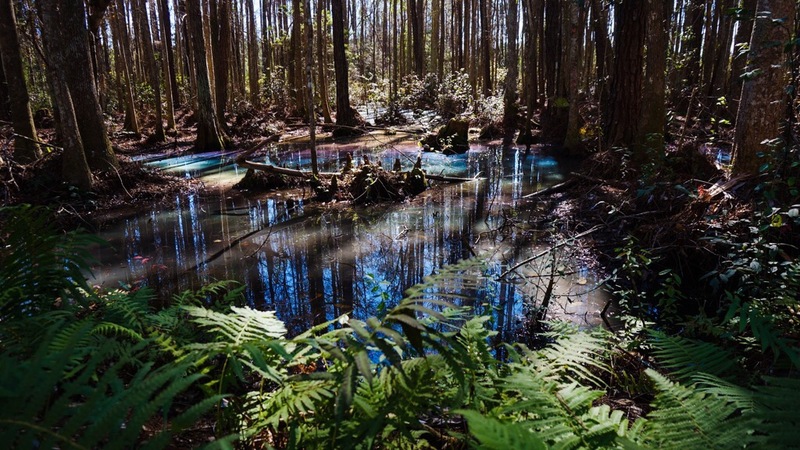 Rainbow Swamps | Florida Hikes! 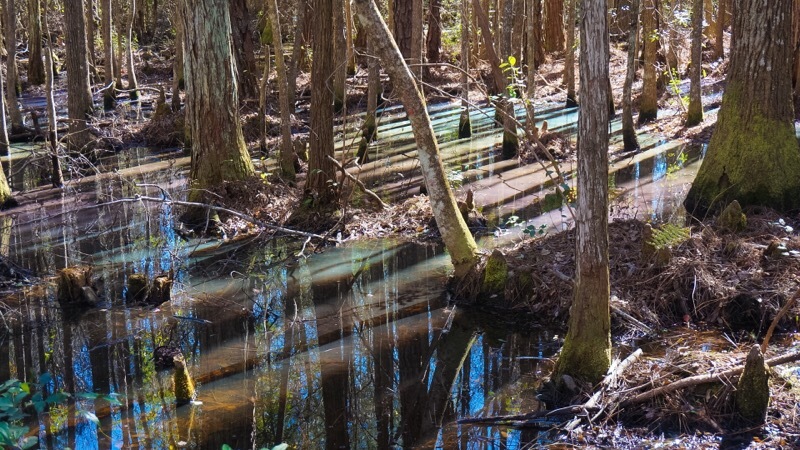 Years ago, when I was leading swamp walks at Clyde Butcher’s Big Cypress Gallery, I noticed what looked like an oil slick on the surface of the water. 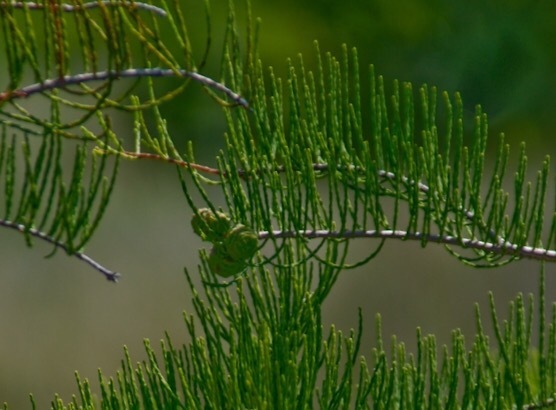 One of the swamp walk leaders with much more experience, Jeff Ripple, explained that the natural oils from the cypress cones disbursed once they dropped in the water. At different angles, the iridescence looks like soap bubbles. 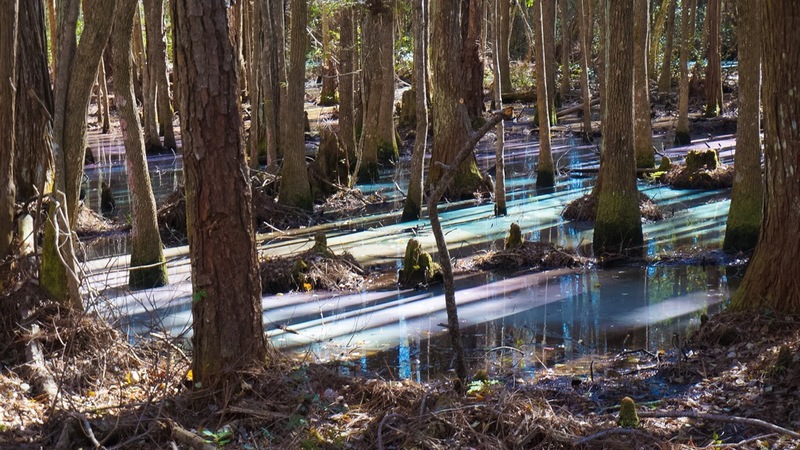 Over the years, I’d noticed this phenomenon in swamps along many Florida trails, as well as somewhat of a faded rainbow effect across the waters. This week, I finally encountered the pastel swamp rainbow effect in all its glory. It was just a few minutes after I struggled through a short piece of the Florida Trail that didn’t deserve the name. My hiking partner PJ had the good sense to walk around it on the forest road. 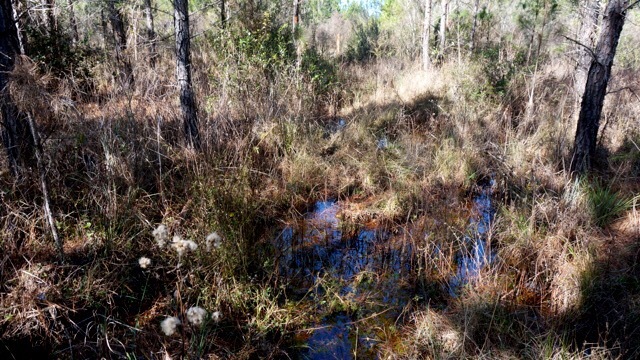 But I plunged into this miasma of gloppy bog, trying to hop from hummock to hummock. I was happy to keep at least my ankles dry. Then I reached the stream. Soft and muddy, and no way to hop it. My utterances were not at all ladylike. I had choice words for the person who routed the trail here. 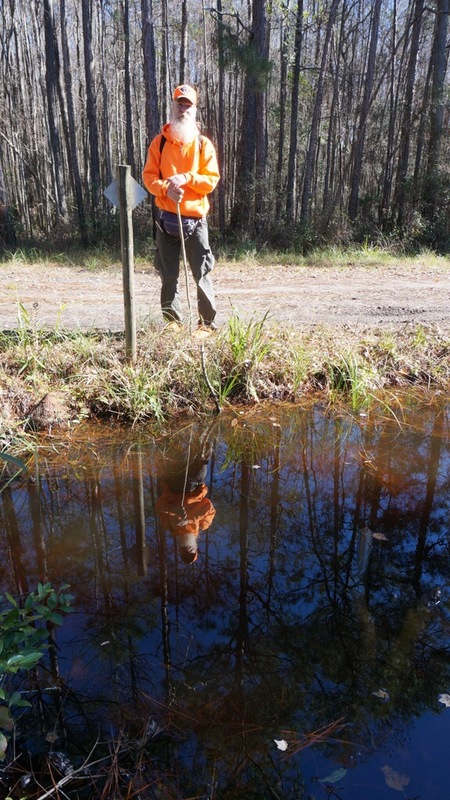 Especially after I waded the stream – no chance to remove shoes in that mud – and encountered a ditch. My language became the bluest it’s ever been on a hike. Especially when PJ proved the depth in front of me was more than three feet. He talked me through the briars and brush to a place where I might be able to hop the ditch. Fortunately, I could. We walked on, now on a forest road, me with my icy wet feet, as I continued to curse the lack of experience of whoever laid out the past ten miles of trail. And then I stopped short. I saw the pastel rainbow across the swamp. PJ didn’t at first. He had to squat down a little to see the play of light across the water. Finding a variety of angles on it, I forgot my anger. Being able to capture this unusual natural phenomenon almost made the hours of lousy hiking worthwhile. Even better: we found it again, in another location, framed by ferns. 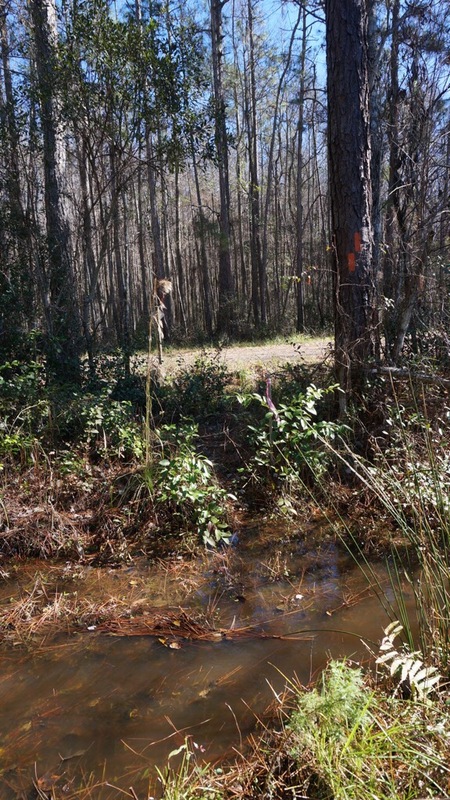 So if you’re ever walking the Florida Trail on a cold blue sky day in the Osceola Experimental Forest, pay attention. You might just find these rainbows too.